Happy March!! We can't believe that we're already in our third month of 2015...where has the time gone? We've had such an amazing (and busy) start to 2015, but we're getting excited as wedding season inches closer and closer! Only three months in, and already 2015 is shaping up to be our best and most exciting year yet! We hope that this new month will usher in a relief from all of the brutal winter weather we've been experiencing...at least a little bit? 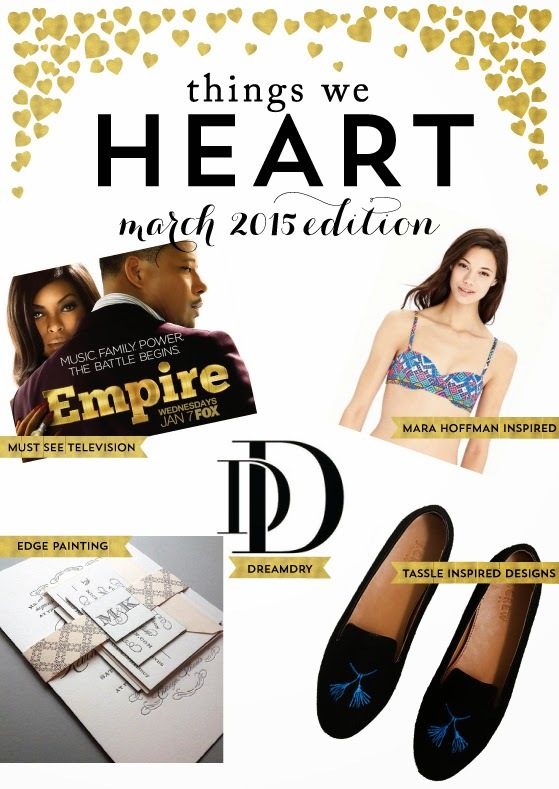 Until spring is here to stay, we're counting our many blessings, and sharing all of the things we heart for March! 1. Empire: At the recommendation of several friends, Lala started watching Fox's new hit show Empire, and can't stop watching! With great music, and an even better storyline, (who doesn't love Cookie?!??!) Empire is must see TV! With only eight episodes airing so far, you can easily catch up on this series after being stuck inside because of winter weather. Set your DVR's now, Empire airs on Wednesday nights! Another show we haven't been able to get enough of lately? House of Cards, of course! One of our team members finished the entire third season in one weekend, and couldn't stop watching! 2. Mara Hoffman Inspired Swimwear: When Lala first spotted this Old Navy swimsuit on Instagram, she knew it had to be hers. As a girl who appreciates both bright colors and bold prints (which are often present in Mara Hoffman's designs), she knew she had to add this budget friendly swimsuit to her wardrobe. She purchased the balconette top and matching bottoms, and couldn't have been happier when they arrived in last week!! Now she just needs warm weather to flaunt her new suit! Find Lala's new swimsuit on the Old Navy website. Old Navy's geometric balconette bikini top. Old Navy's geometric bikini bottom. 3. Edge Painting: A printing technique our entire team has been having fun with lately is edge painting! What exactly is edge painting you ask? It's simply what the name implies: painting the edge of an invitation with color. We think it's a really fun way to incorporate a fun pop of color, without overloading a design with a ton of color. 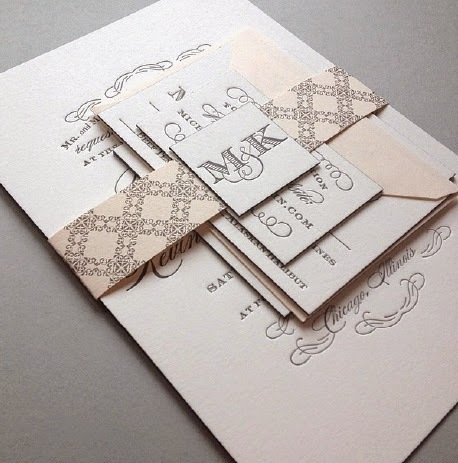 Also, it's a great way to incorporate a "modern twist" to something traditional like a wedding invitation. 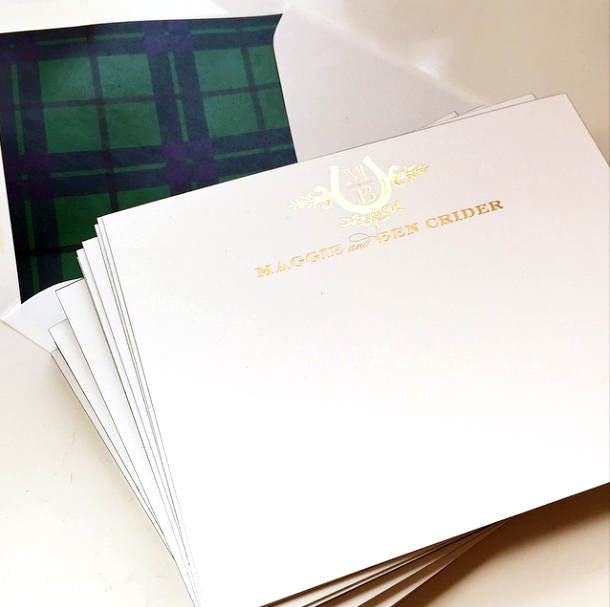 Recently, we shipped out a wedding invitation ensemble with all of the edges painted in black...which really was the "cherry on top" of an already fabulous invitation. Check out some of our favorite edge painted designs below. For Michelle and Kevin's wedding invitation, we kept the design simple and elegant. Printed in traditional letterpress, the couple wanted to add a fun, modern twist to their invitation, so we decided to paint the edges gray! For more of M&K's Chicago Trump Hotel Wedding, be sure to visit their real wedding gallery! Here's the black edge painted invitation we recently completed! 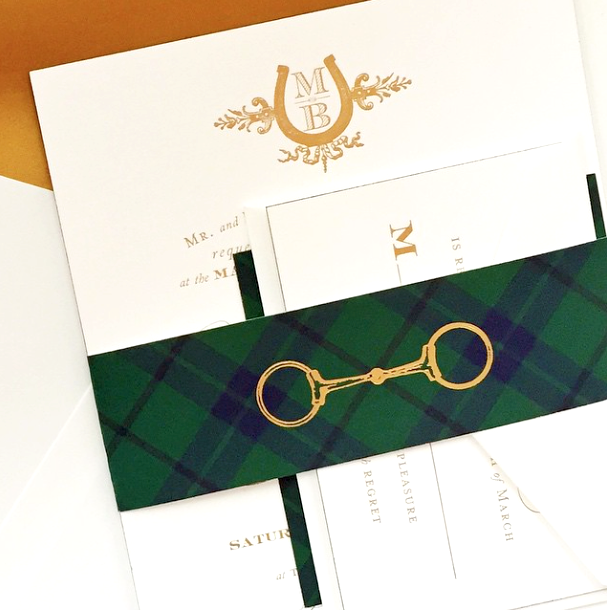 The black edging was the perfect finishing touch on this elegant, equestrian inspired wedding invitation! The couple's coordinating wedding stationery also included black edge painting. 4. 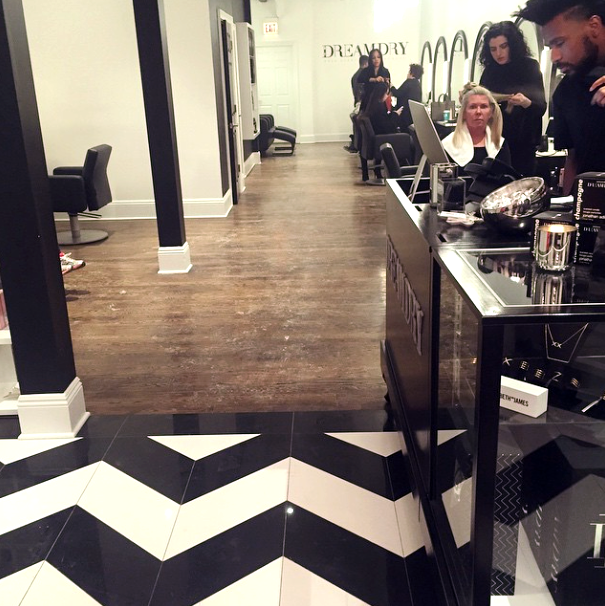 DreamDry: Before a night on the town, N&L treated themselves for a Friday night blowout at Chicago's newest blowdry bar, DreamDry! Because there's nothing in the world that makes a girl feel more fabulous than a fresh blowout. The chic interior (done in all black and white) instantly made us feel at home, and we left with super glossy, bouncy tresses! In the words of owner Rachel Zoe, this place is bananas. We can't wait to go back!! 5. Tassels: From fashion pieces to home decor, right now we can't get enough of tassels!! This traditionally preppy accent is having a major moment, and we just can't get enough. Our love of tassels are even extending into wedding invitation design, as we recently designed an ensemble tied together with a tassel. We can't wait to share pictures!! Until then, we're loving these tassel trimmed accessories!! 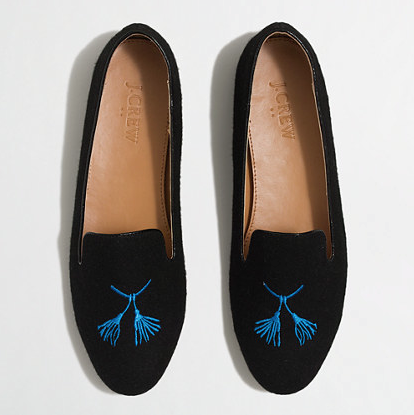 Tassel printed loafers from our favorite J.Crew Factory! Super cute! 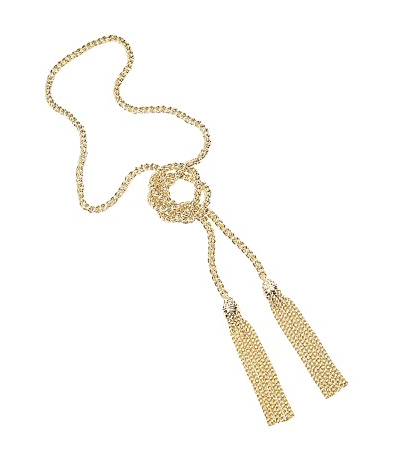 We love this tassel inspired necklace from Kendra Scott! It offers a bright pop of color! The Jackie tassel necklace, also from Kendra Scott, can be easily layered and paired with other necklaces! So chic and cute!! Wishing you all an amazing month of March!! Love them all! and happy March.